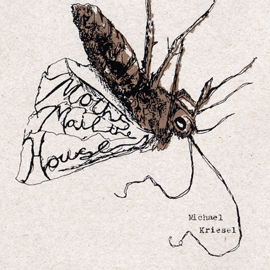 "Michael Kriesel’s Moths Mail the House...captures a gritty, stark feeling that is haunted around the edges, and calls to mind the mood of Tennessee Williams or David Mamet. The 19 poems in this 12.5 cm x 12.5 cm text range from childhood at the hands of an alcoholic father to scenes of nature to lost love, creating a loose narrative of the thematic 'self' as he seems to be slowly becoming his father." "One of my favorite small press poets, easily in the Top 5, is Michael Kriesel. His recent collection, Moths Mail the House, is a unique beauty5"x5", hand-stitched, with a silk-screened cover. ... He has absorbed the essence of minimalist poetic art from various sources, and now spreads it back out on his own particular canvas. He's a poet at peace with himself, self-confident, humble, unafraid to try something new." "Michael Kriesel is a Wisconsin poet of my recent discovery who sheds new light on poetry as a fine art form. The philosopher Arthur Schopenhauer maintained that poetry is 'the true mirror of the real nature of the world and life,' and this holds true for Kriesel’s work, which in form, indicates possibility and multiplicity, and in language, is spare and fined down to the essence of a moment. ... Adhering to Schopenhauer’s poetic philosophy, Kriesel’s poetry is a jump in a placid silver lake."